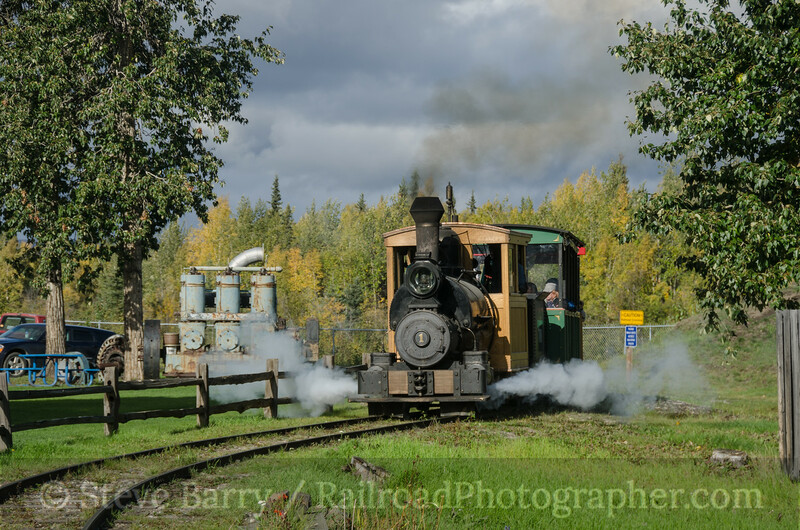 In the last edition we looked at the last operating steam locomotive in interior Alaska at the Tanana Valley Railroad Museum in Fairbanks. And while the TVRM and the White Pass & Yukon are both narrow gauge, there is a movement to bring standard-gauge steam to the Alaska Railroad. The big steam news in Alaska is the repatriation of Alaska Railroad 2-8-0 No. 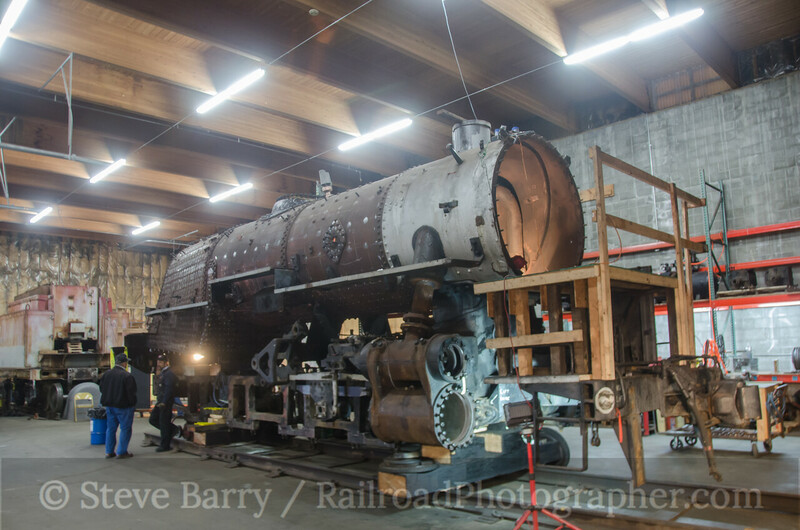 557, which is undergoing restoration in Wasilla. No. 557 was built by Baldwin in 1944 for the United States Army Transportation Corps as No. 3523, but was immediately diverted (along with 11 sisters) to Alaska for World War II logistics. Eventually, No. 557 would become the last steam locomotive in service on the ARR, finishing its career in Nenana where it would occasionally switch the yard when flood waters made diesels non-functional. It would also be used for special events. The last use for No. 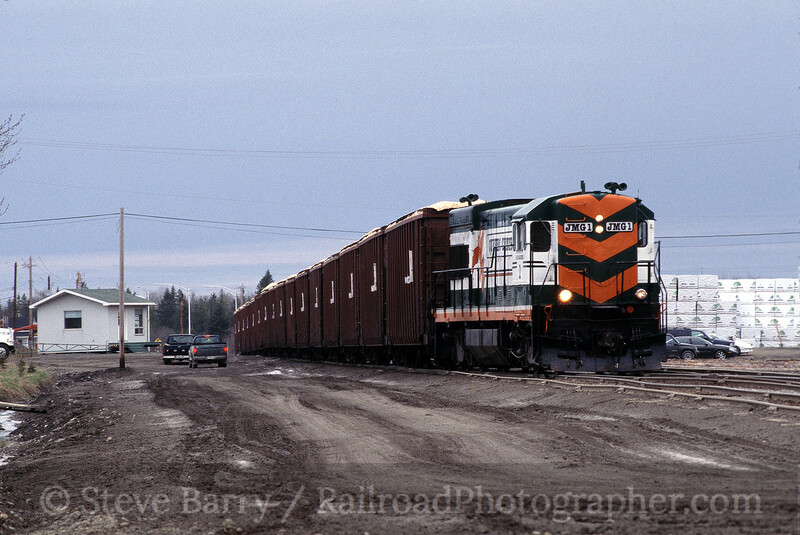 557 came in 1962 as it shuttled passenger trains through flood waters at Nenana, handing the trains off to diesels at either end of the water. 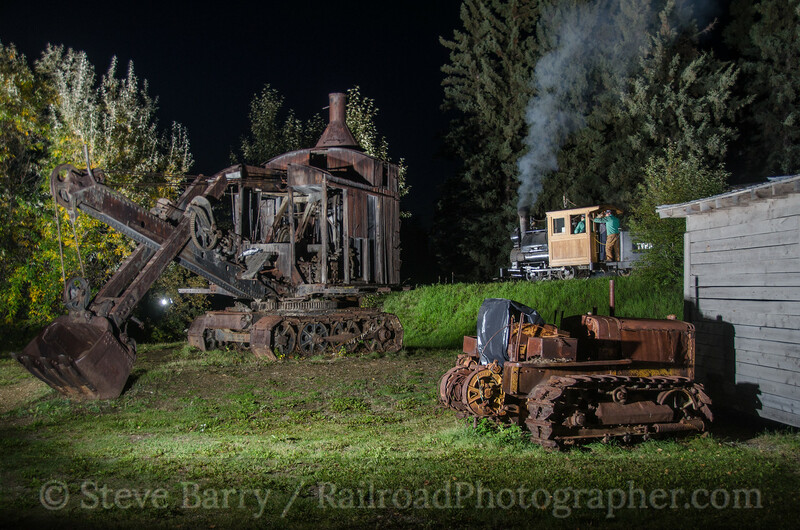 In 1964 the locomotive was purchased by a scrap dealer in Everett, Wash., but was saved by Monte Holm, who bought the engine for his “House of Poverty” museum in Moses Lake, Wash. (the locomotive and its original tender were separated prior to the move from Alaska). Holm passed away in 2006, and his grandsons sold No. 557 to the Jansen family, long-time friends, who were interested in seeing the engine saved. 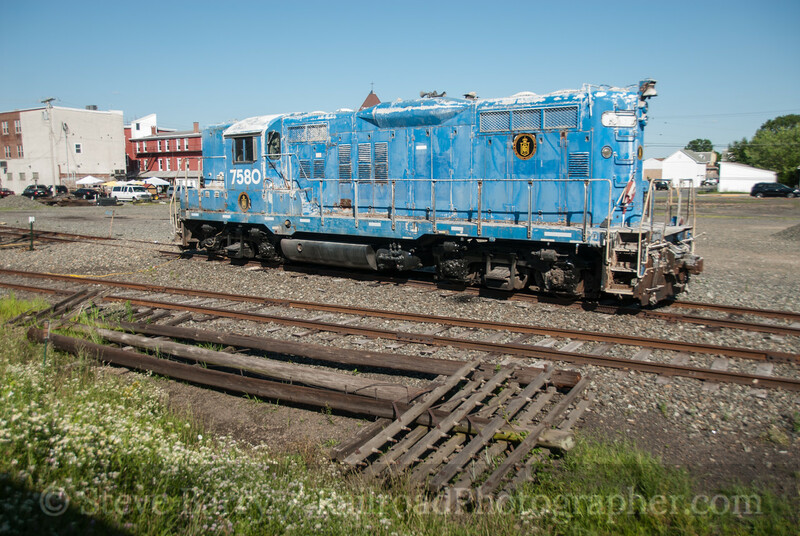 The locomotive was donated to the Alaska Railroad under the condition that it be restored, and the railroad established the 557 Restoration Company to oversee the work. Currently housed in a shop in Wasilla (owned by the ARR), No. 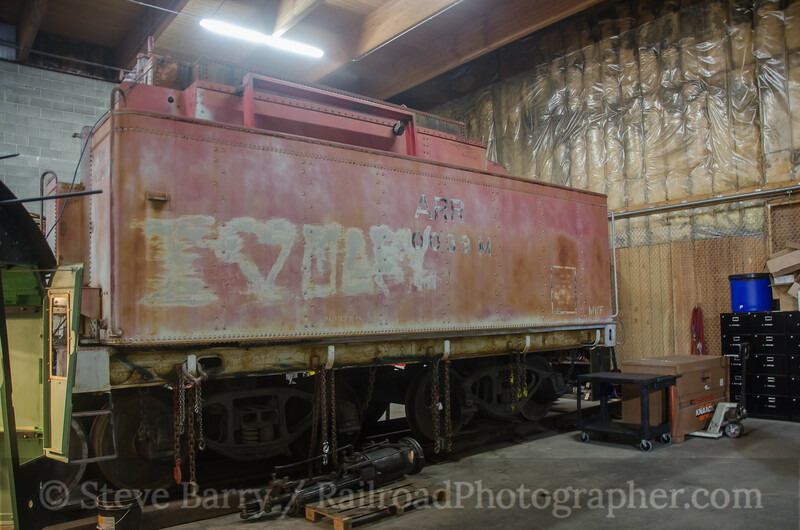 557 has received a tender from a work train preserved at the nearby Museum of Alaska Transportation & Industry and could return to the rails as soon as 2015. 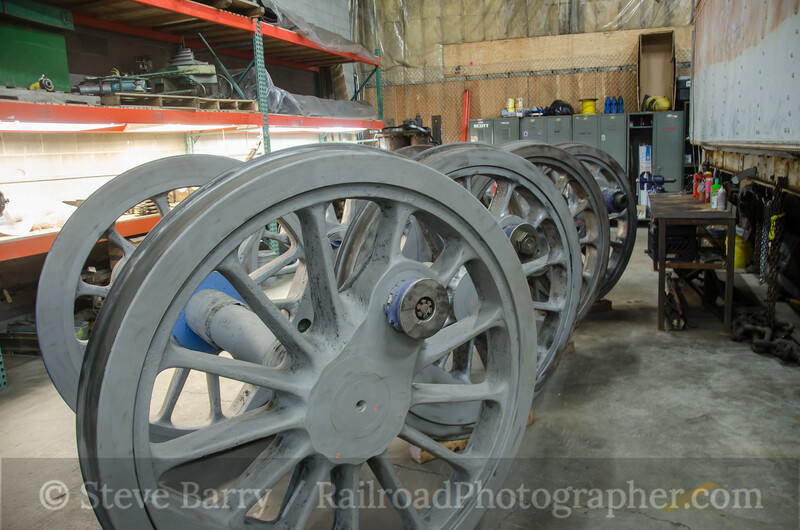 A walk through the Wasilla shop shows the progress being made on the locomotive. 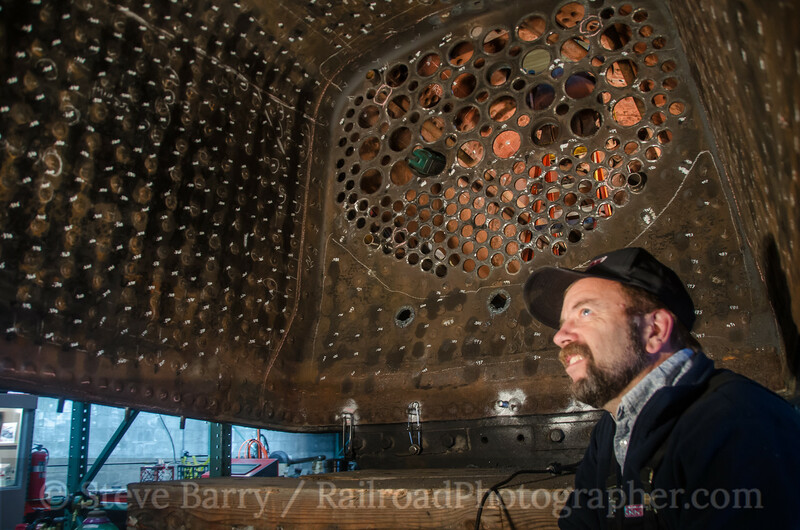 The inside of the firebox shows the work done by Art Chase to ultrasound the locomotive to look for thin spots (a few were found). Meanwhile, No. 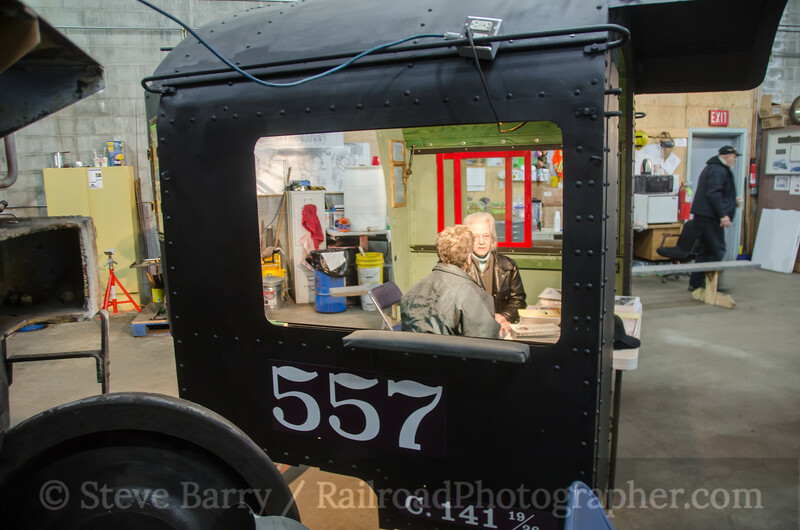 557's cab has been repurposed (temporarily) as the project's gift shop. Sister engine No. 556 is on display in Delaney Park in downtown Anchorage. It was outfitted with ramps, railings at platforms, making it a large playground jungle gym. It has recently undergone a complete cosmetic restoration that has, thankfully, made it presentable once again. My visit to Wasilla was in September 2013. Certainly more has been accomplished on the 557. For more information check out 557 Restoration Company. The largest state in the U.S. has but one small operating steam locomotive in semi-regular service (the White Pass & Yukon occasionally operates steam on the coast out of Skagway). Today's tour will take us to Fairbanks, where we'll visit Pioneer Park. This park has an interesting story of its own, dating back to 1961 when the Pioneers of Alaska requested public land to establish Pioneer Memorial Park to showcase the history of Alaska. In 1965 the Alaska '67 committee requested the park be used for the centennial celebration of the purchase of Alaska from Russia, which opened as the Alaska Centennial Exposition in 1967. In 1968 Pioneer Memorial Park was donated to the state of Alaska, which immediately donated it to the city of Fairbanks. On May 1, 1968, Fairbanks mayor Red Boucher renamed the park “Alaskaland.” However, since the park has no rides like most theme parks and the Alaskaland name conjured up something similar to Disneyland, the Pioneer Park name was restored in 2002. Today the park is free to enter, although many of the individual museums charge admission. 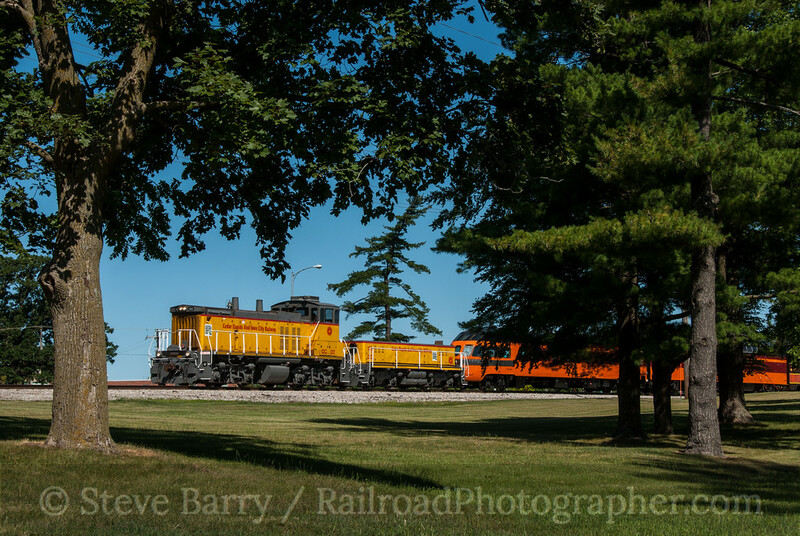 Pioneer Park has three railroad attractions within its 44 acres. First is an observation car used by President Warren G. Harding when he participated in the ceremony completing the Alaska Railroad in 1923. 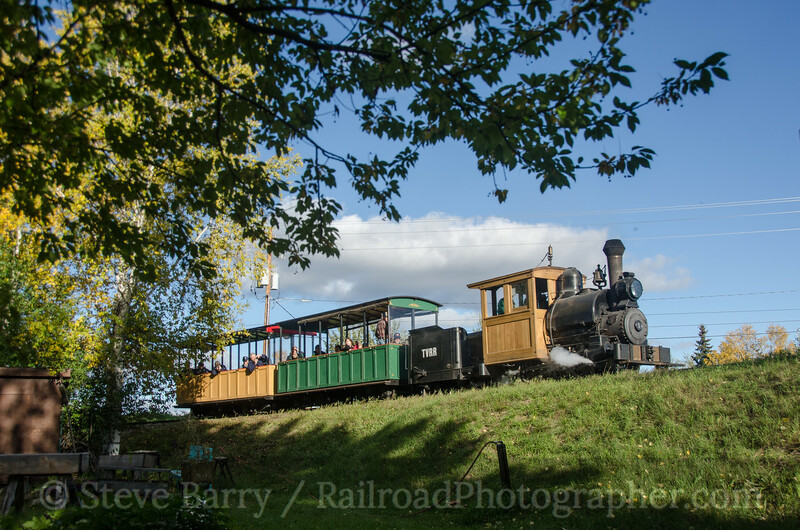 Second is the narrow gauge Crooked Creek & Whiskey Island Railroad, a three-foot gauge line that circumnavigates the park on about a mile of track and uses a small diesel locomotive for power. 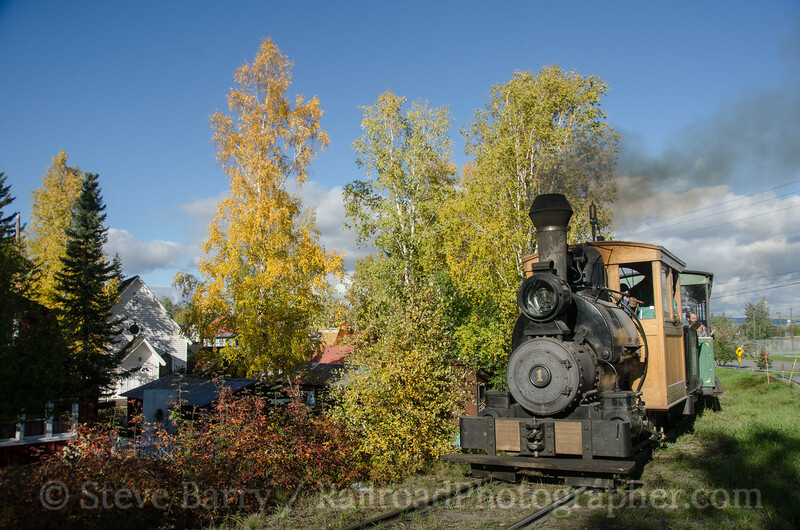 The third is the Tanana Valley Railroad Museum, which is home to interior Alaska’s only operating steam locomotive. TVRM has two buildings within Pioneer Park, a large shop building and a smaller museum. It is in this shop where Tanana Valley No. 1, an 0-4-0T, has been restored. Built by H.K. Porter in 1899, No. 1 was purchased by the North American Transportation & Trading Co. for hauling coal from Cliff Creek, 50 miles from Dawson, Yukon Territory. 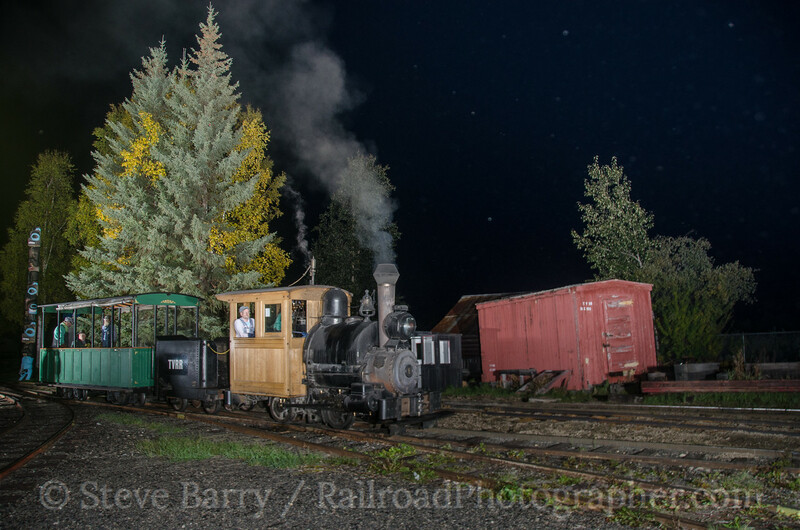 It was sold to the Coal Creek Coal Co. in 1903 and in 1905 it was sold again, this time to the Tanana Mines Railway (later the Tanana Valley Railroad), becoming the first steam locomotive in interior Alaska. The Tanana Valley was absorbed by the Alaska Railroad in 1917 and No. 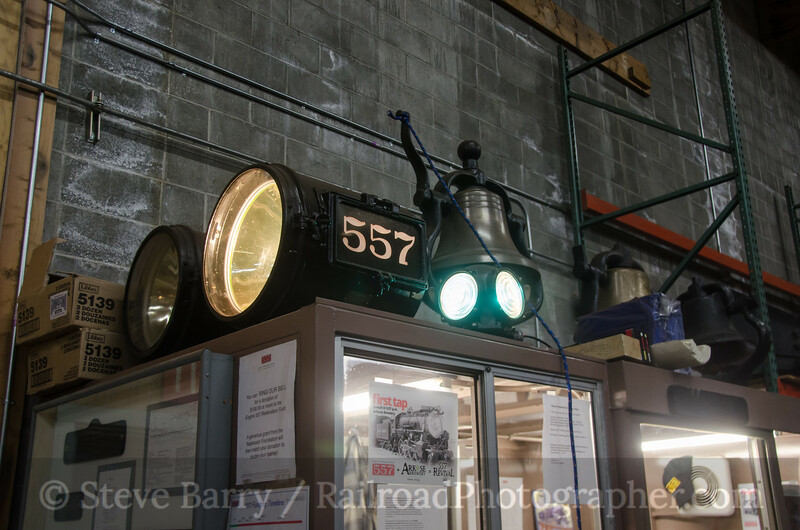 1 remained on the ARR roster (albeit “unfit for service”) until it was donated to the City of Fairbanks in 1927 and placed on display at the station. 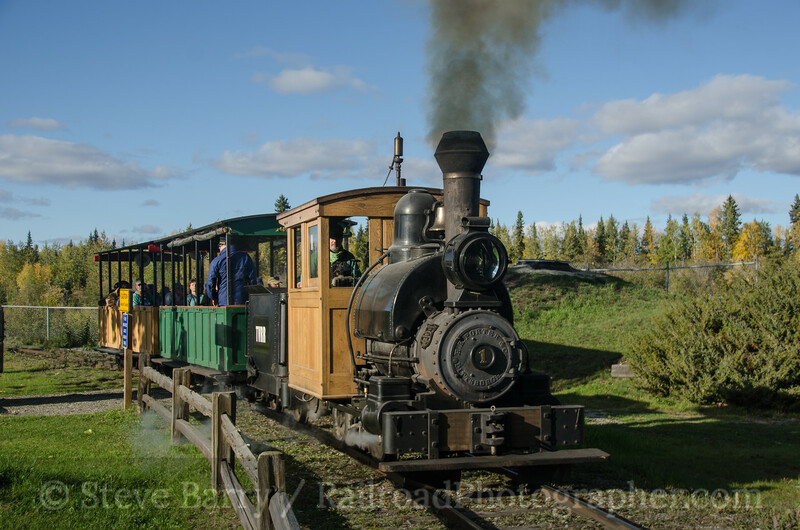 It was moved to Pioneer Park for the Alaska centennial in 1967, and then leased to the Friends of the Tanana Valley Railroad, Inc., in 1992 for restoration and operation. The museum was built in 2005 and opened in 2006. Today No. 1 operates on the one-mile loop around Pioneer Park on a limited schedule. The line features a couple of impressive grades, and the little engine works hard pulling its open-air cars. 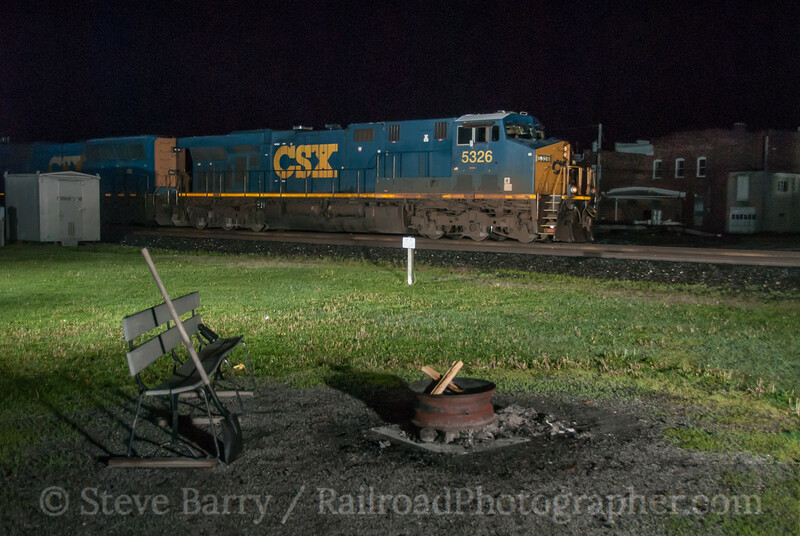 Our visit for these photos occurred in September 2013 as part of the convention of the National Railway Historical Society. More Pioneer Park photos can be found here. 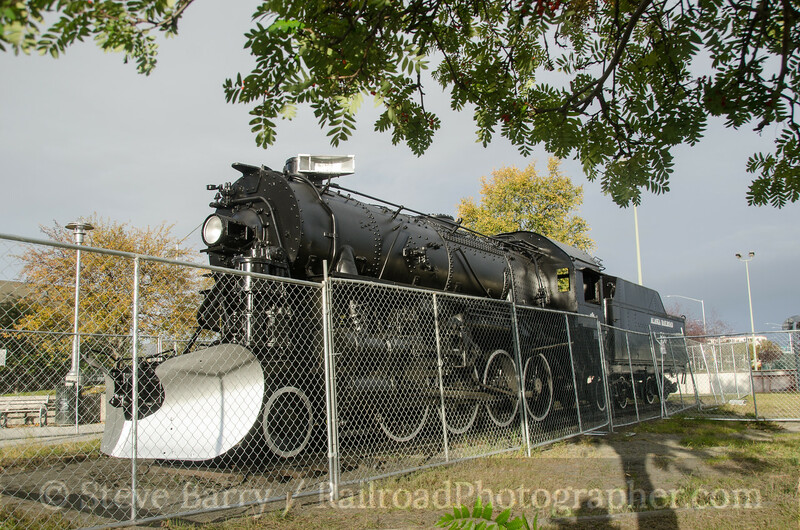 There are a couple of other small steam locomotives on display along the route of the Alaska Railroad, although you’ll have to go almost all the way to Anchorage to find them. Off the main line and not far from Wasilla, you’ll find Premier Coal Company No. 5, a three-foot-gauge 0-4-0T, adjacent to the repurposed Palmer station. 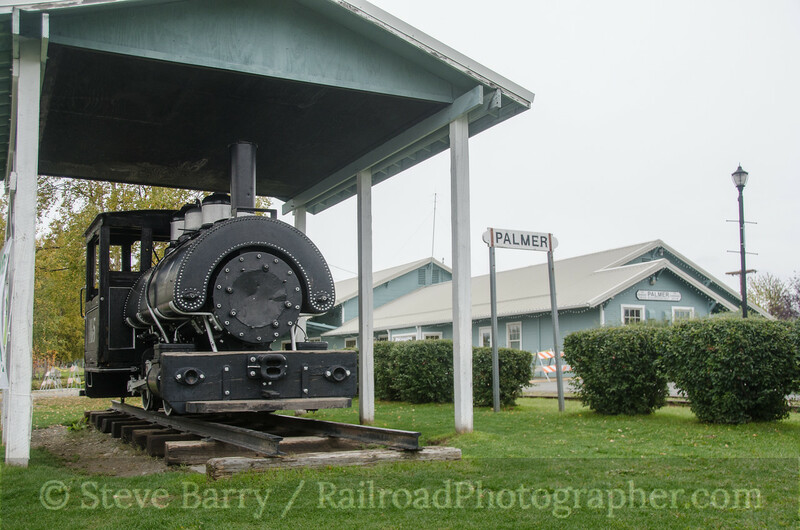 The Alaska Railroad’s tracks are still in place at Palmer, although the branch is now only served as far as a gravel mine for freight and as far as the State Fairgrounds at the new South Palmer station for passenger trains. No. 5 was built by Baldwin in 1910, one of three sister locomotives purchased for the construction of the Alaska Railroad. 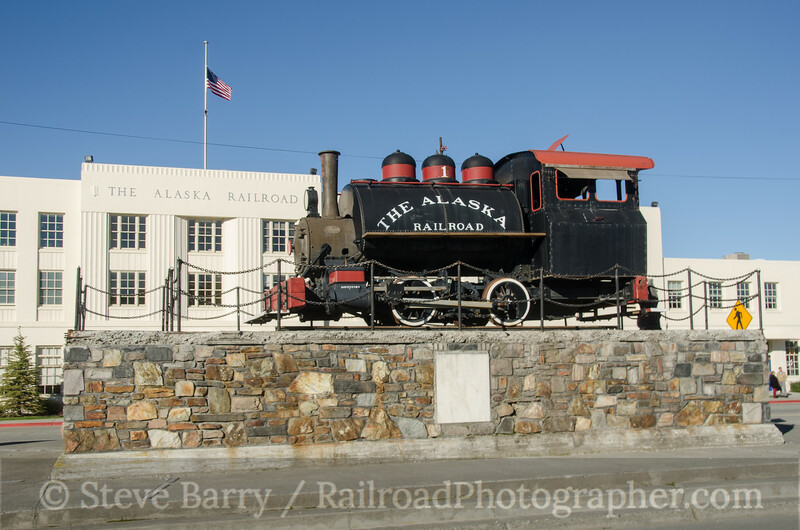 In Anchorage you’ll find a standard gauge 0-4-0T on display directly in front of the Alaska Railroad’s depot. This locomotive was built by Davenport in 1907 as a narrow gauge 0-4-0T for the Panama Canal Commission where it worked as No. 802. In 1917 the Alaska Engineering Commission (the predecessor to the Alaska Railroad) received surplus locomotives from Panama and No. 802 became No. 6, working on the construction of the ARR. In 1930 it was converted to standard gauge to serve as the Anchorage shop switcher. Upon retirement in 1947 it was made the “honorary No. 1” and used for special occasions until being placed on its current display pedestal in 1952. Ah, yes. Green trees add to a nice scenic photo. Trees between you and your subject can be distracting, but as long as the trees are behind the train, everything is good. or is it? Sometimes you have bad tree placement that makes it appear the tree is attached to the train. 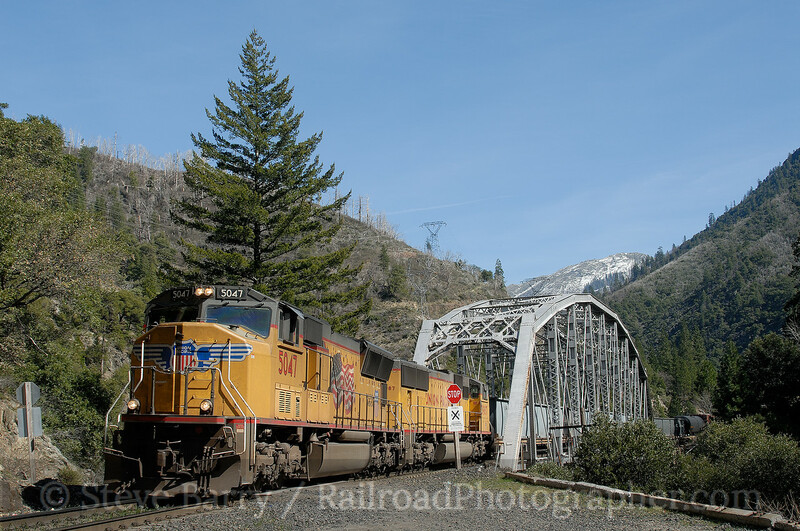 In the photo above, taken along the former Western Pacific in California's Feather River Canyon, you have to wonder how that tree got tied to the cab and how did it make it through the bridge. So the next time you're out shooting, remember that trees in front of the train aren't the only problem. 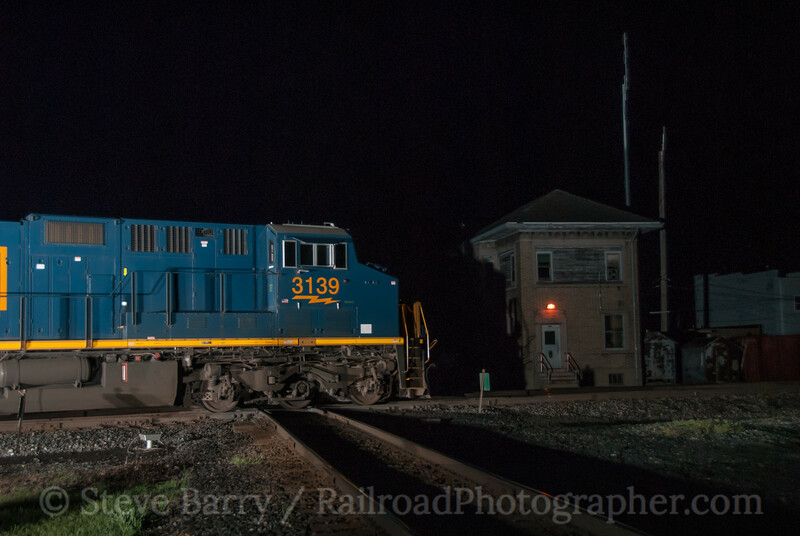 This is the third and last installment of our current series on busy railroad junctions in Ohio. 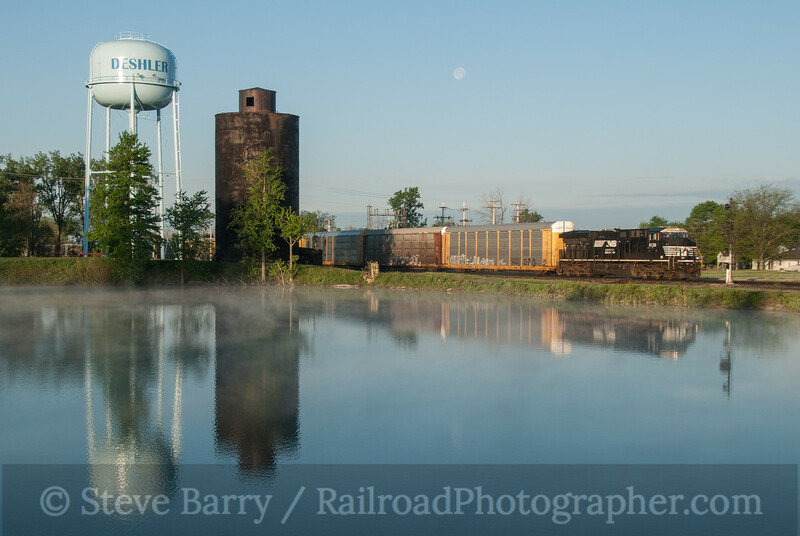 In previous posts we spent a night at Crossroads Park in Deshler and visited the abandoned tower at Leipsic. Today we stop in at the town of Marion. The center of the action is Marion's Union Station, located where two north-south lines cross an east-west line. From the east, the Erie and Cleveland, Cincinnati, Chicago & St. Louis ("Big Four," a New York Central subsidiary) shared tracks across the diamonds. The Erie and Big Four split after the diamonds continuing west. 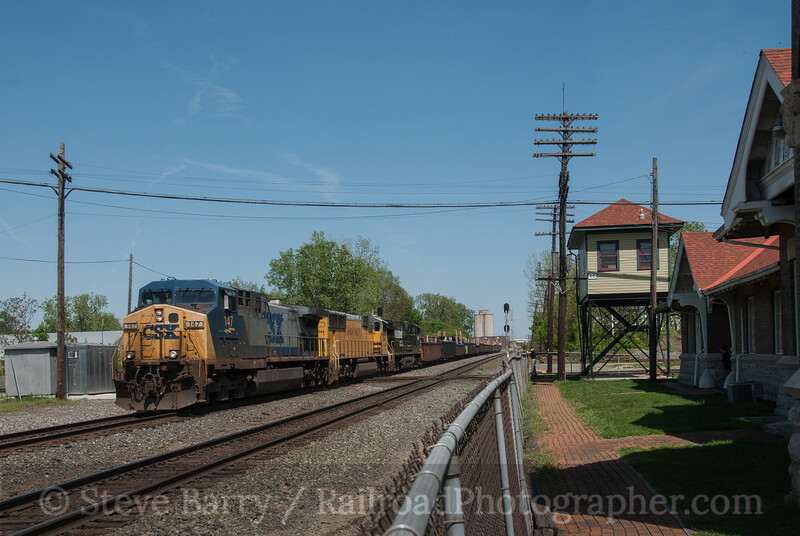 Today only a stub of the Erie remains to the west, while CSX uses the Big Four. 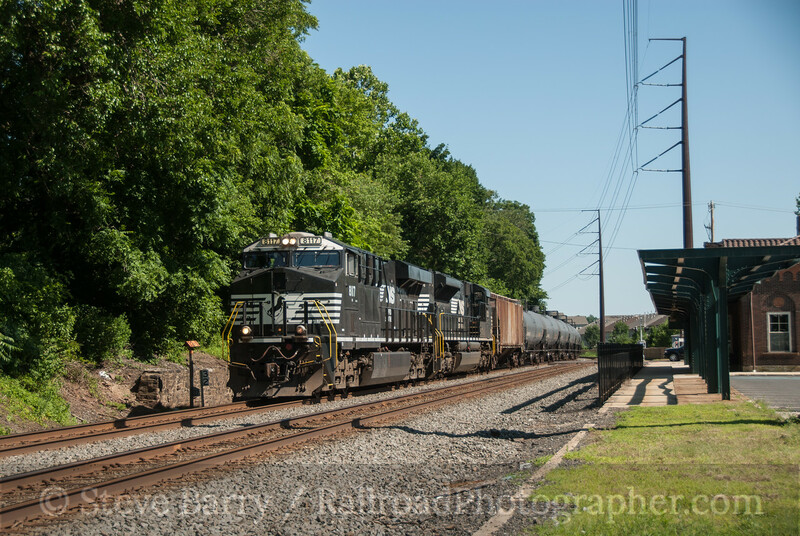 The easternmost of the north-south lines is the former Pennsylvania Railroad and is now used by Norfolk Southern. The westernmost north-south line is the former Hocking Valley, now used by CSX. Union Station sits south of the Big Four with platforms for all three lines. 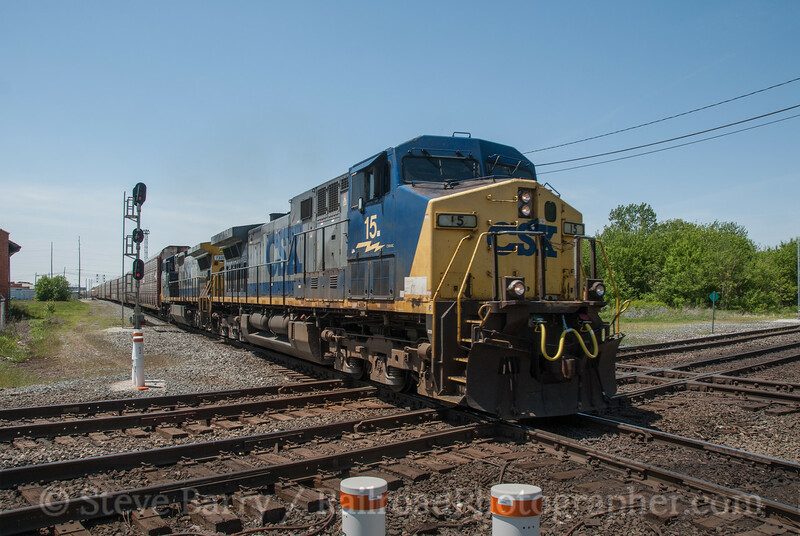 I arrived with my brother Bruce at Marion at about 2:00 on May 19 and we were soon greeted by an eastbound train on the Big Four led by CSX AC4400CW No. 15, which we shot rattling across the ex-Hocking Valley diamond (above). 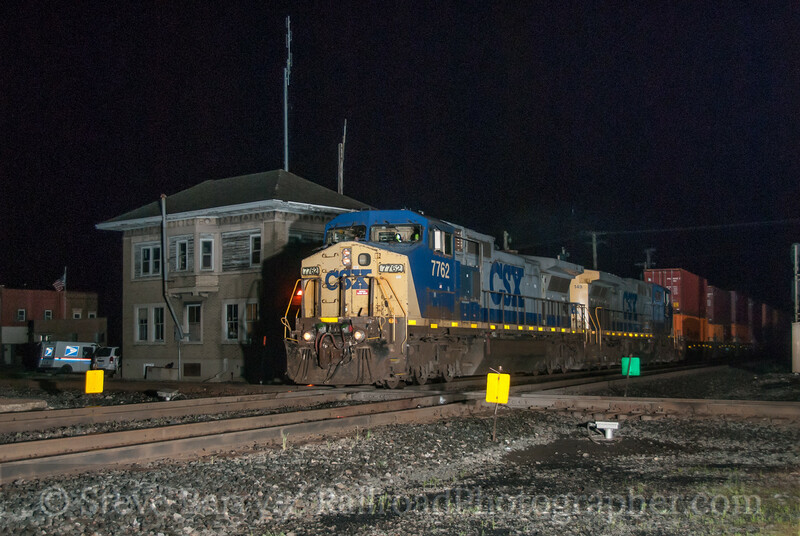 A few minutes later, a local freight came down the Hocking Valley behind CSX No. 2308, a former GP30 converted into a road slug. 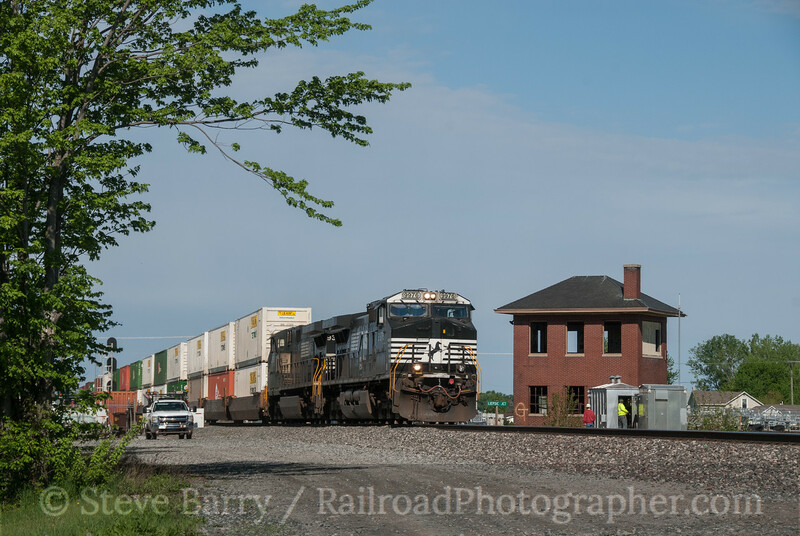 After about a half-hour lull, Norfolk Southern got into the action on the ex-Pennsy. C40-9W No. 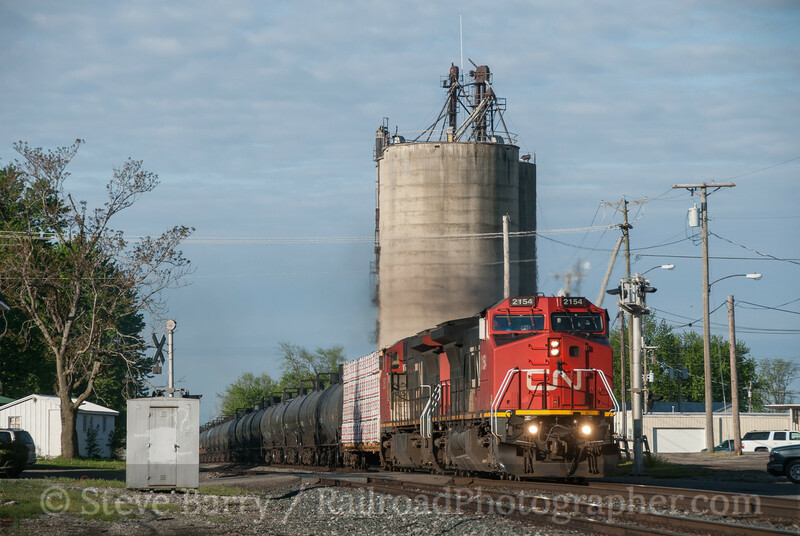 9924 came south with a grain train, passing restored AC Tower. the tower sits adjacent to the station. Another half hour later and the sun had swung around favoring westbounds on the Big Four. 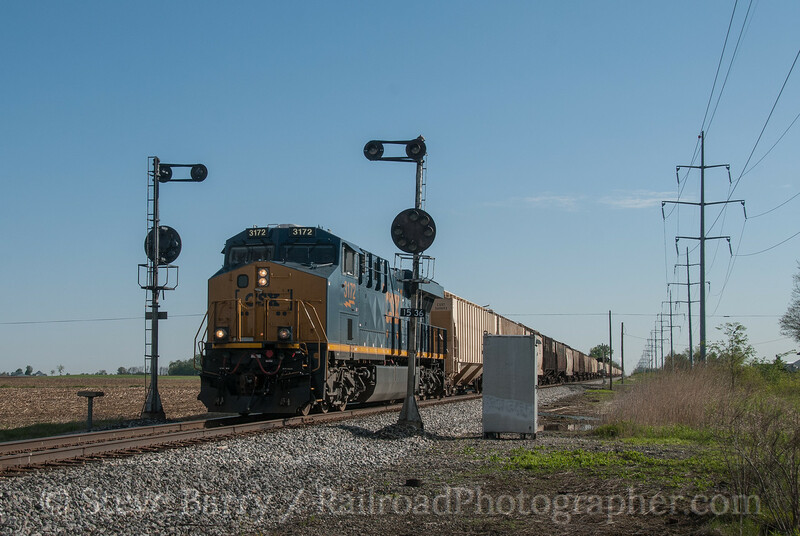 CSX obliged by sending a train across the diamonds, passing AC Tower and Union Station. In all, it had only been an hour and half since the first train showed up, and we wound up with trains on all three lines. More from Marion can be found here. As I write this, it was 45 years ago today that man first set foot on the moon -- July 20, 1969. And I am reminded of one of the few times I got the chance to mix railroads and rockets. 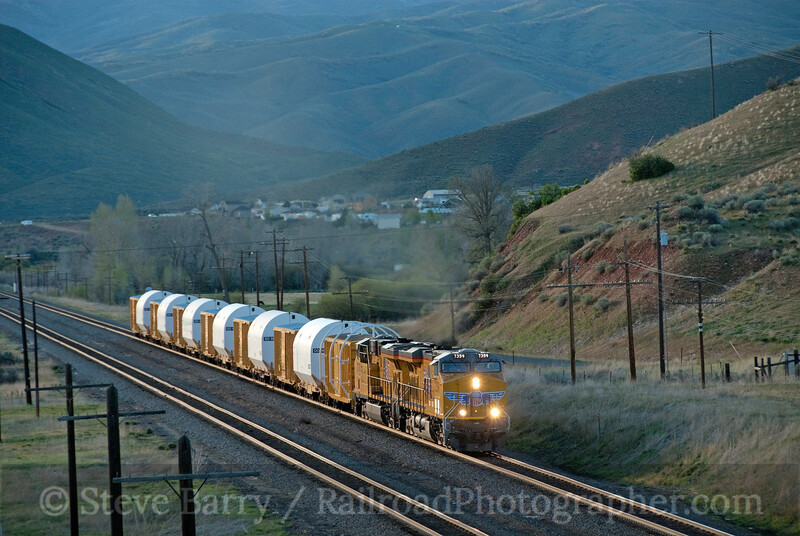 In May 2010 I was in Utah for photo charters on the Heber Valley Railroad. With a free afternoon I headed to two scenic canyons that are located several miles apart from each other on Union Pacific -- Weber and Echo. I started hearing reports on the railroad radio about a high-and-wide move coming east, so I went west through Weber Canyon and found a well-guarded train with six strange containers. Not wanting to mess with the guards, I headed back east and set up at Henefer, located halfway between Weber and Echo. The high-wide train was easy to track on the radio -- because of the wide dimensions, the dispatcher didn't want the train passing other trains on curves, so the special train dashed to straight sections of track for all meets. Finally the train arrived and I got the above photo. It wasn't until I returned to New Jersey that I discovered what I had photographed. NASA's space shuttles are sent into orbit using solid rocket boosters manufactured by Thiokol in Brigham City, Utah, and shipped to Florida via train. This train was the very last set of solid rocket boosters for the shuttle. Without knowing it at the time, I captured the end of an era in the U.S.'s exploration of space. 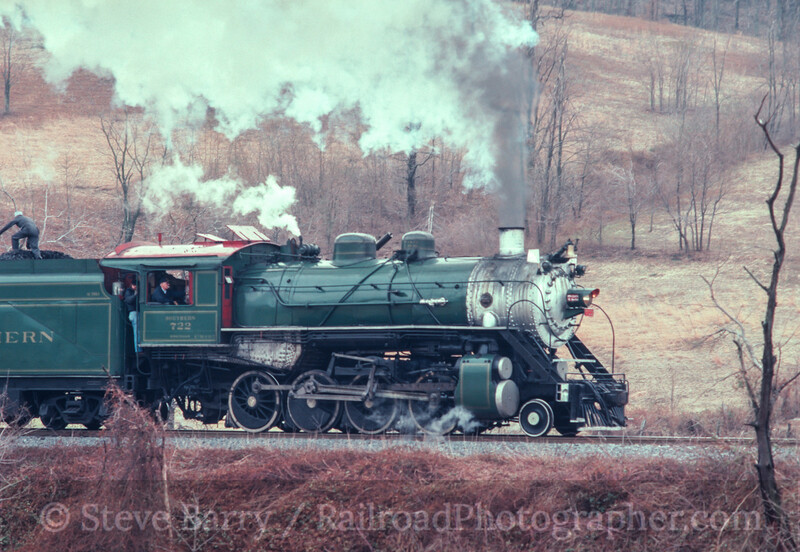 The Southern Railway Steam Specials operated all over the southern U.S. in the 1970s until the 1990s with trips almost every weekend except for the winter months. Living in New Jersey, however, most of the trips were not within an easy drive from home. 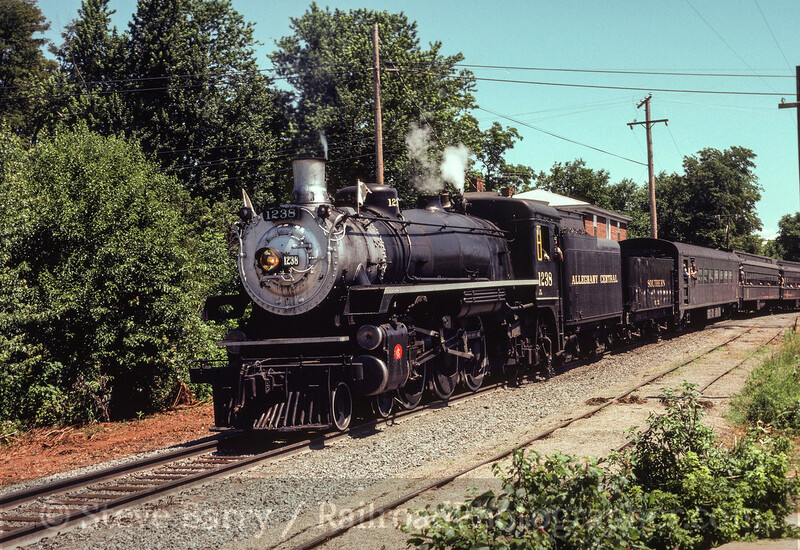 The closest starting point for steam trips was Alexandria, Va., where trips either headed down the Southern main line to Charlottesville or over the lightly-used branch to Front Royal. The main line trips were a pain to chase, so the branch trips became favorites. One of the first trips I chased to Front Royal was on March 29, 1980, when 2-8-0 No. 722, decked out in Southern green and gold, made the trip (above). Diesels were not used as helpers on these trips, so when the chunky Consolidation hit the steep grade of Linden Hill, it went to a crawl with plenty of noise from the stack. The Southern was still the Southern in June 1981 when steam once again ran to Front Royal. Finding itself power short (2-8-2 No. 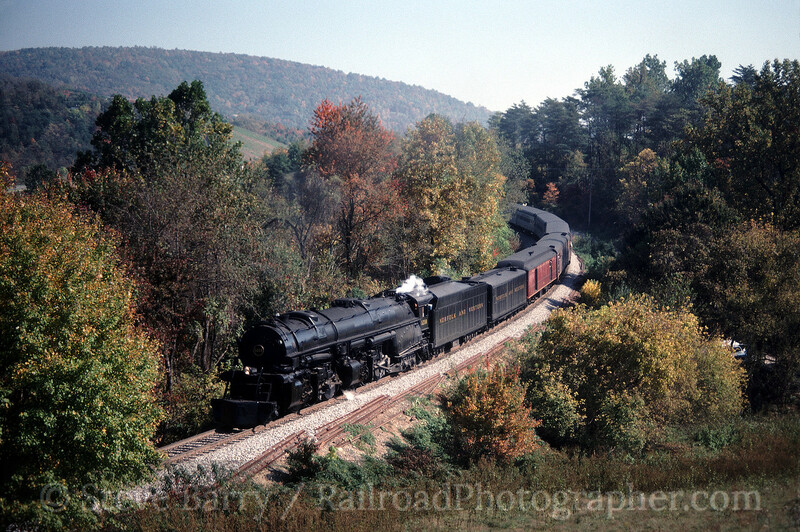 4501, the primary locomotive in the program, seemed to be perpetually down when the Alexandria trips rolled around each year), Southern leased a former Canadian Pacific 4-6-2 from the Allegheny Central tourist operation. No. 1238 ran a few trips on the branch, including a "photographers" trip that had most of the planned photo stops cancelled when the engine ran short of coal. The 1982 merger of the Southern Railway and Norfolk & Western to create Norfolk Southern only expanded the steam program. New engines were brought into the fold in the form of two N&W locomotives -- 4-8-4 No. 611 and 2-6-6-4 No. 1218. Interestingly, despite being a larger locomotive, No. 1218 could run on the Front Royal Branch while 611 could not due to weight restrictions; 1218 had its weight spread out over more wheels and thus could run on the branch. The photo below required keeping one eye on the track and one eye on a temperamental bull that didn't like strangers in his field. 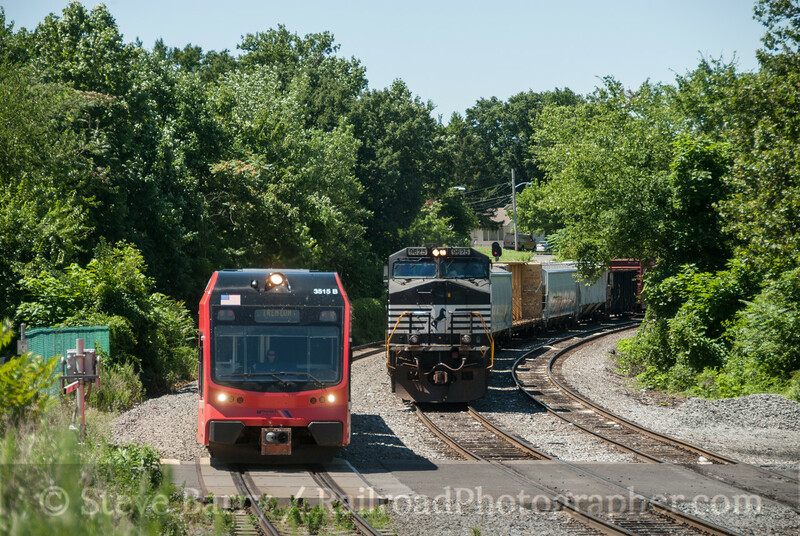 The Norfolk Southern merger meant an increase in traffic on the Front Royal Branch, as it became a through route for trains bypassing the Washington, D.C., area. 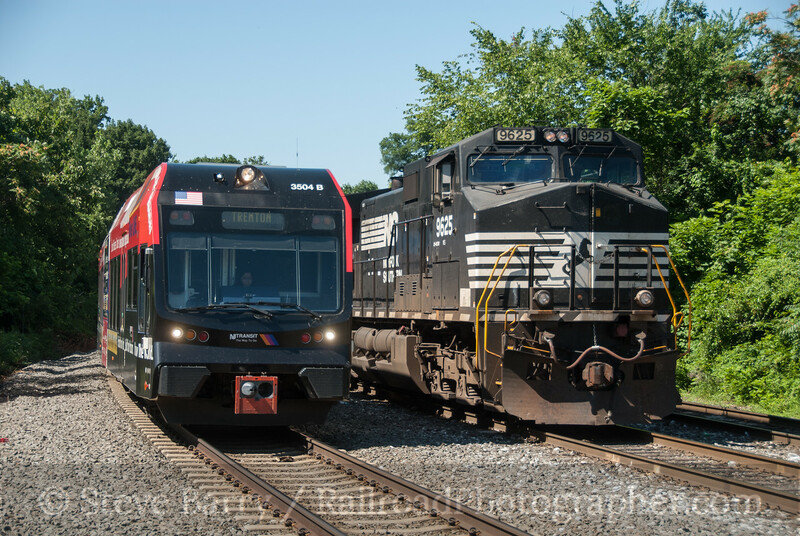 NS trains would come down the Shenandoah Line from Harrisburg, Penn., and Hagerstown, Md., to Riverton Junction near Front Royal, then traverse the branch over to the former Southern main line near Manassas to continue south. The upgrading meant that No. 611 could now use the line; it also meant the days of laid back charters were coming to a close as the steam trains had to dodge the new parade of stack trains. 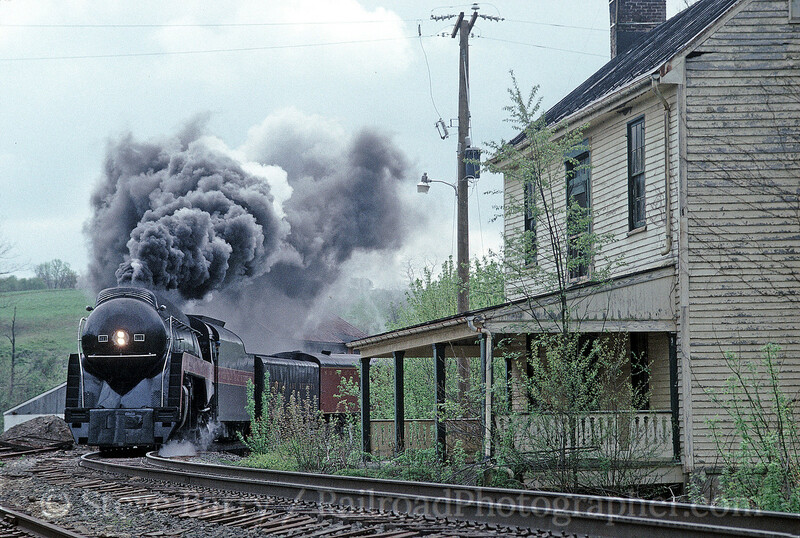 Norfolk & Western 611; Rectortown, Va. 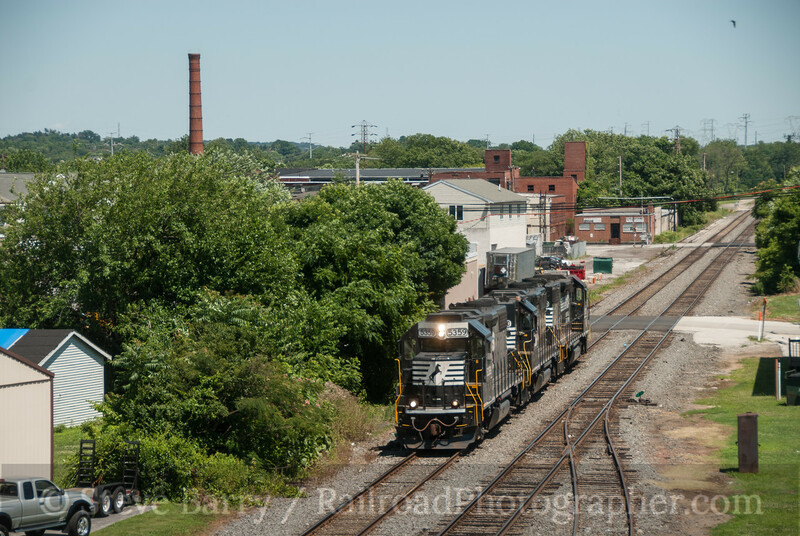 The Norfolk Southern steam program came to a close in 1994, but has seen a bit of a comeback since the advent of the 21st Century Steam program a few years ago. Maybe one day I'll get back down to Alexandria and chase another steam special to Front Royal. In our last post we started on a trip to the conference of the Center For Railroad Photography & Art in suburban Chicago. On the way out my brother Bruce and I stopped at two busy Ohio junctions, and stopped at a third on the way home. In the last post we spent a night at Crossroads Park in Deshler. 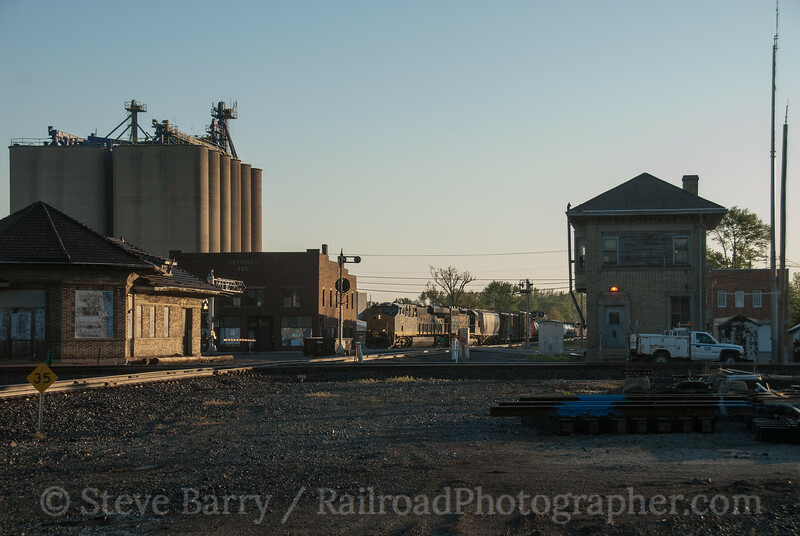 After sunrise on May 16, we left there and headed to another busy junction town, Leipsic. Leipsic actually has two diamond junctions where two lines cross at grade. 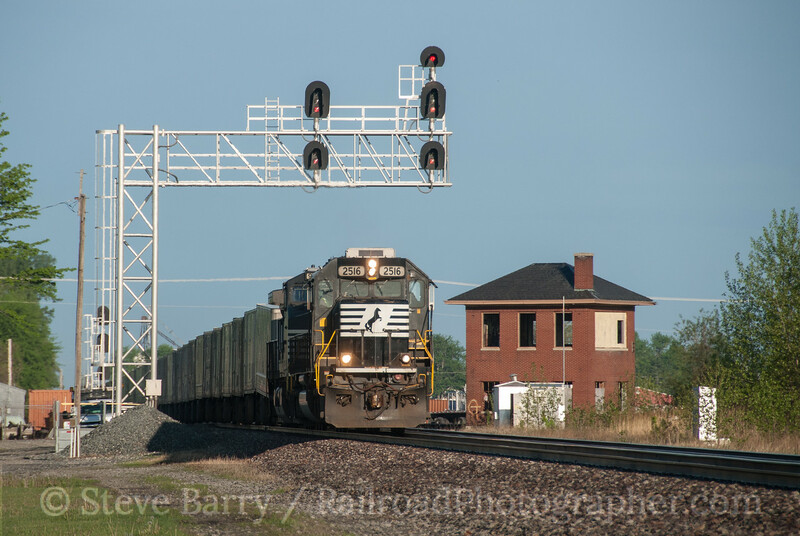 The former Nickel Plate Road (officially the New York, Chicago & St. Louis, now a part of Norfolk Southern) is the east-west line through town. It crosses the former Cincinnati, Hamilton & Dayton (later part of the Baltimore & Ohio and now a part of CSX Transportation), and the shell of the interlocking tower that protected the junction is still there. Just a bit further west the ex-Nickel Plate crosses the former Detroit, Toledo & Ironton (this part of the old DT&I is now operated by the Indiana & Ohio Railroad). 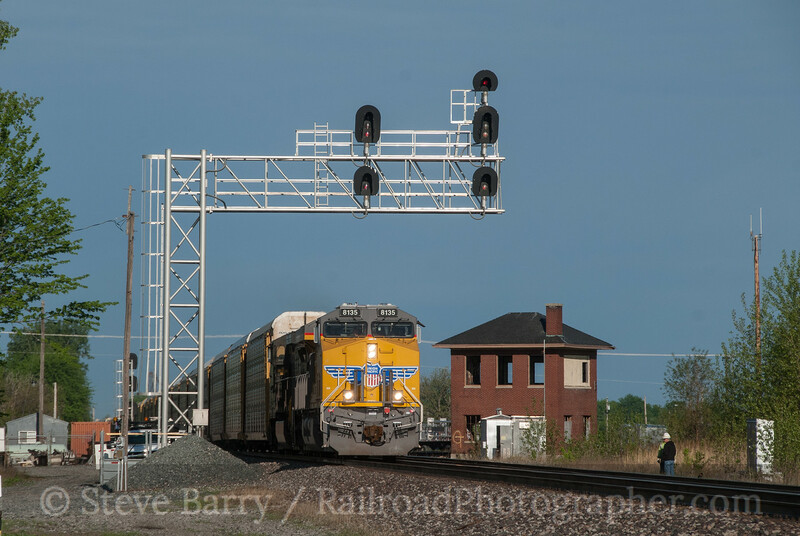 We got to Leipsic and were quickly greeted by our first train, an eastbound Roadrailer on NS (two photos above). Roadrailers are hybrid semi trailers that can operate on both highways and railroads. We then heard horns south of town and caught a northbound oil train on the former CH&D with Canadian National power leading. Oil trains need a spacer car between the locomotives and the first tank car, and this is usually a boxcar; in this case it was a loaded center-beam lumber car. Back at the NKP/CH&D diamond, our next train was an eastbound on the former Nickel Plate, an autorack train led by Union Pacific power. We caught it with the tower as a photo prop. Looking down the tracks from the NKP/CH&D diamond we could see a CSX local heading south over the DT&I diamond. 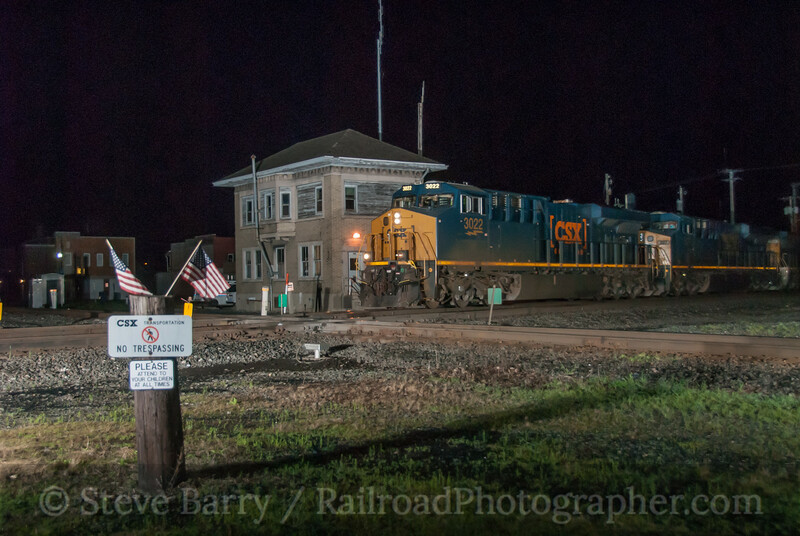 We raced south of town and got it passing between a set of classic Baltimore & Ohio color position lights. 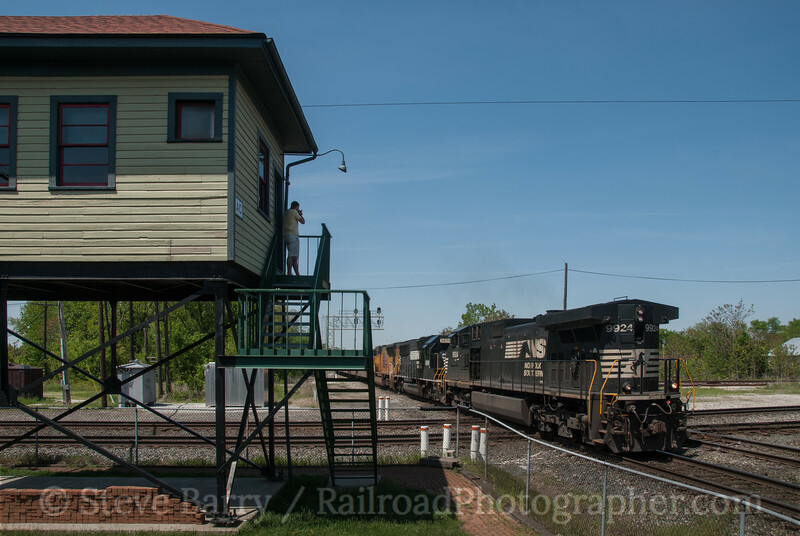 From there it was back to the tower for one last eastbound on the former Nickel Plate. 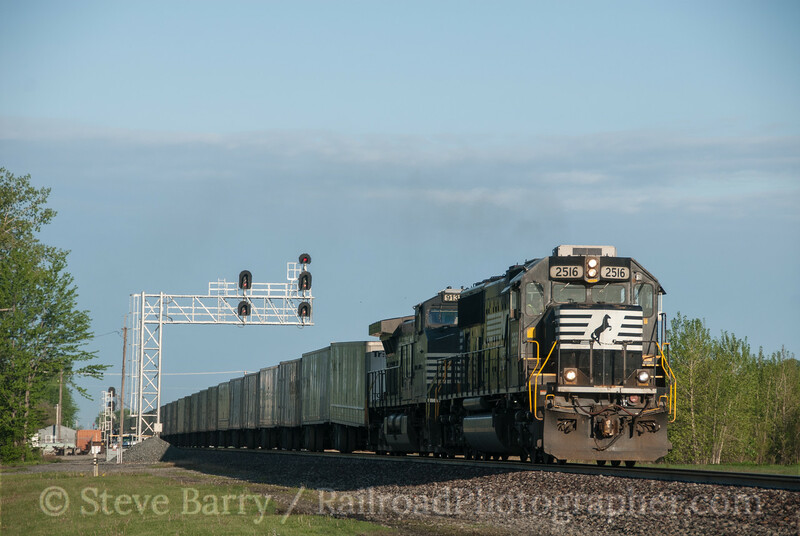 A Norfolk Southern stack train finished off our visit to Leipsic. In all, it had been a very brief and very active two hours in the Ohio town. You can find more photos from this day here. 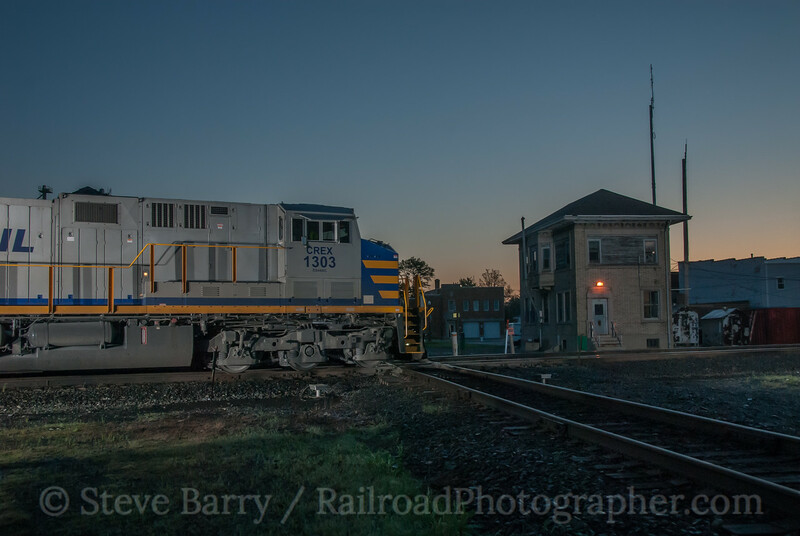 One of the more interesting rail operations in Canada sprung up at the turn of the 21st Century in Quebec. A trucking firm revitalized the Quebec Central Railway after the line had been abandoned for almost six years. First a little background. 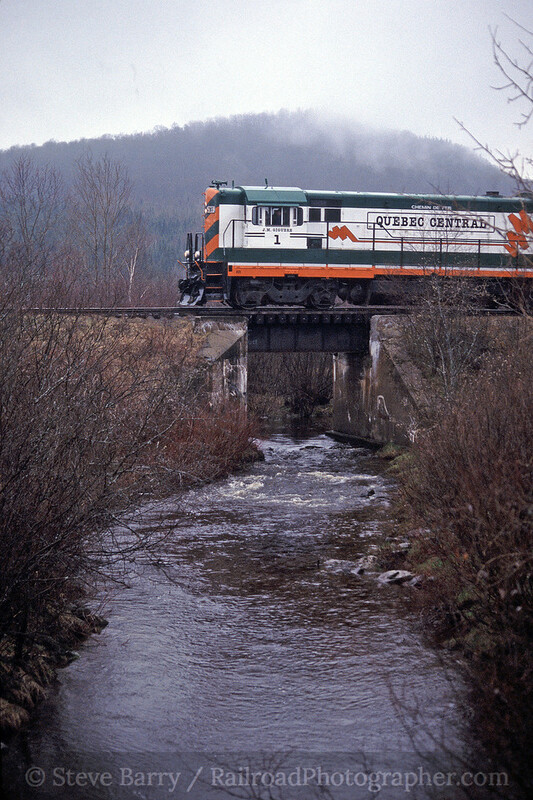 The original Quebec Central was incorporated in 1869 as the Sherbrooke, Eastern Townships & Kennebec Railway, changing its name to the Quebec Central in 1875. In 1912 the Canadian Pacific leased the Quebec Central for 999 years, but retained its QC identity. Passenger service ended in April 1967 and freight service ended in November 1994; a month later CPR officially abandoned the railroad. However, since CPR only owned ten percent of the stock in the line, it could not rip up the track and dispose of the assets. The track lay dormant for almost six years until Jean-Marc Giguere, owner of trucking firm Express Marco, Inc., purchased the railroad in December 1999. By June 2000 trains were running again. I had the pleasure of visiting the railroad in May 2002 along with George Pitarys and Bill Linley. The highlight (at least as far as locomotives go) was a high-nosed ex-Southern Railway U23B. The new QC's locomotives had a unique numbering system that combined names of Giguere family members and a number; the U23B was numbered JMG1 (Jean-Marc Giguere 1). We caught it at Ste. Rose crossing a small stream (above). 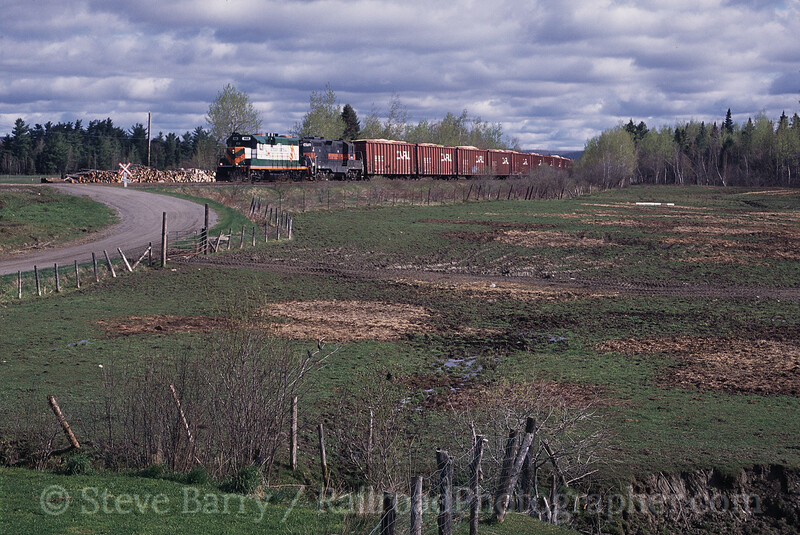 The railroad operated out of Sherbrooke right up to the Maine border at Lac Frontiere. However, it was on no particular schedule. Wherever the train finished work one night would be where it would start the next, and finding the train was no easy matter. A roll of Canadian pennies was sacrificed as we pennied the tracks at various grade crossings, then went back to check later to see if a train had gone by. After several squashed pennies, we were finally able to zero in on the train. 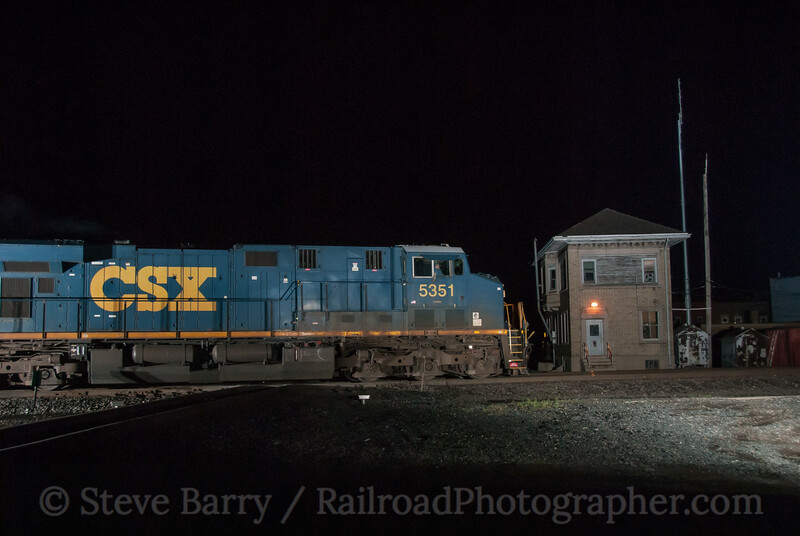 We eventually photographed the train at Daquaam, just a stone's throw from the Maine border, loading woodchips. 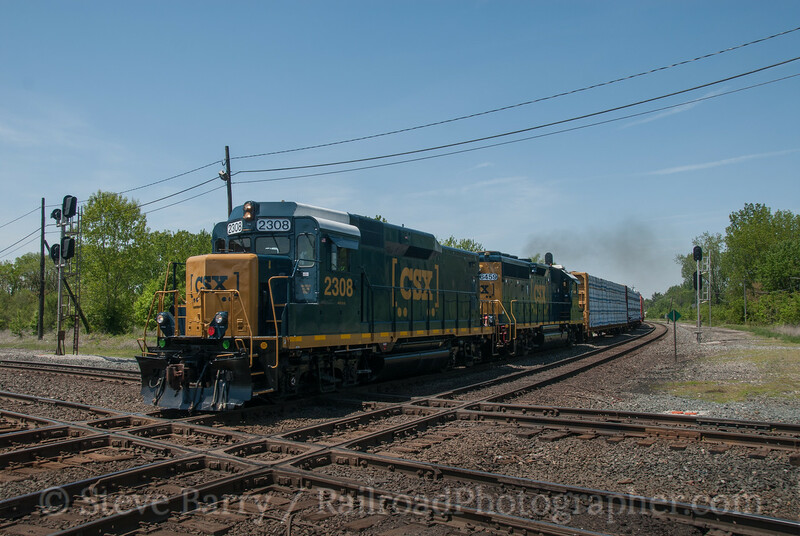 Other power on the railroad included a pair of ex-Illinois Central GP11s (one an ex-reading GP7 and the other an ex-New Haven GP9) with numbers SG2 and GG3 (Silvain and Gaston Giguere, respectively), ex-Delaware & Hudson U23B GG4 (Dany Giguere), ex-Maine Central GP7 RG5 (Roger) and an Alco S2 that broke the numbering pattern with GS9 (Giguere Switcher 9). We caught one of the GP11s and the GP7 at Dudswell Junction, where the sun made a very rare appearance on this trip. The railroad was ultimately abandoned again in 2006, but this time was purchased by the Quebec Ministry of Transport. Service has since been restored to parts of the railroad. 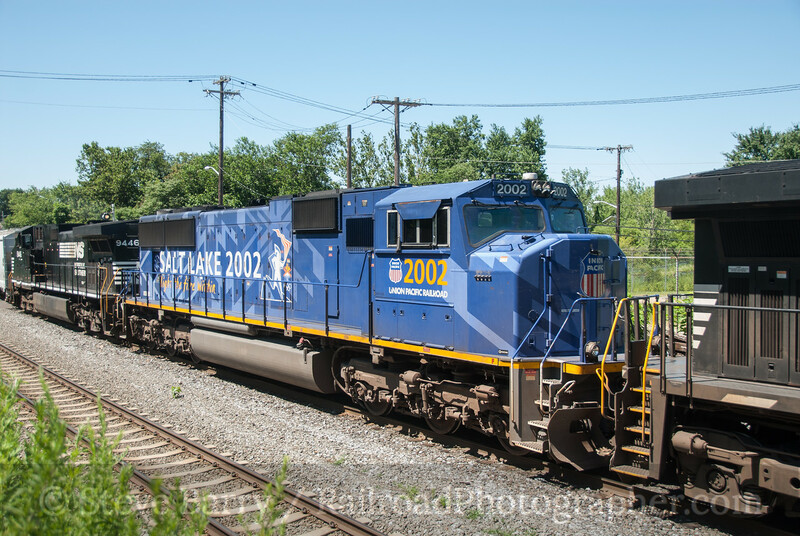 The 2000-2006 version of the Quebec Central was a neat operation, and I'm glad I had a chance to see it. It's a little bit difficult, I'll admit, too get too excited when a locomotive with a special paint scheme is running second in a consist -- after all, out in front is where it looks best. 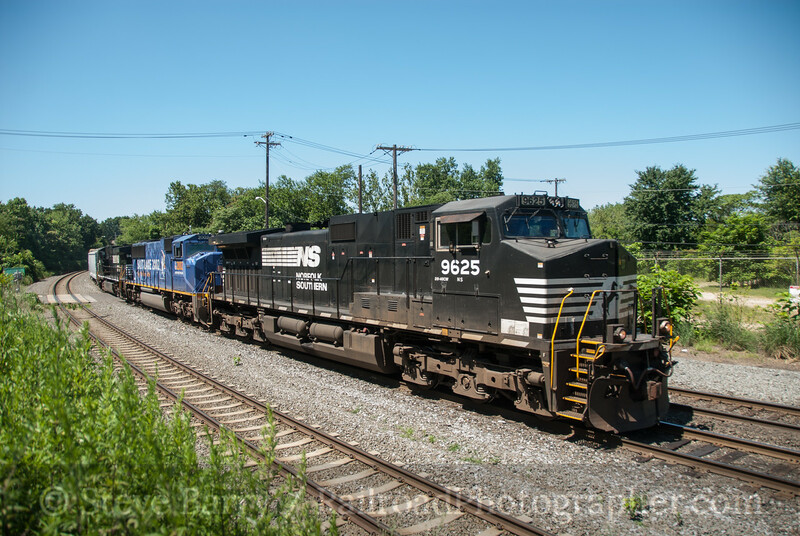 But with not much else happening on July 5, I headed to Pennsauken, N.J., along with Michael Burkhart where a Norfolk Southern freight had a special unit in the consist -- Union Pacific No. 2002, painted for the 2002 Olympics in Salt Lake City. Arriving at about 9:45 a.m., there was time to get the sitting freight (awaiting a new crew) as RiverLine diesel powered light rail trains passed on the adjacent track. The RiverLine is operated by New Jersey Transit between Camden and Trenton. 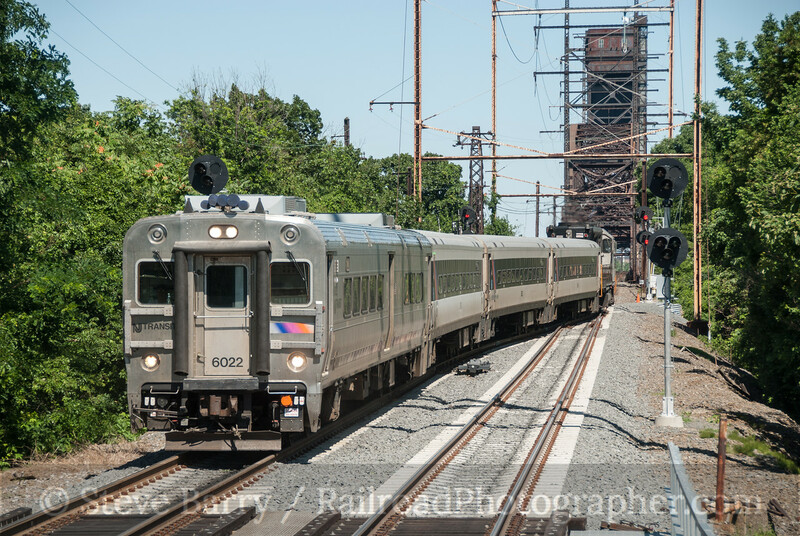 With nothing happening imminently, we headed a couple of miles north to where New Jersey Transit's Atlantic City Line crosses the Delaware River (and the RiverLine) at the Pennsauken Transportation Center in Delair to get an A.C.-bound train with a cab car leading. 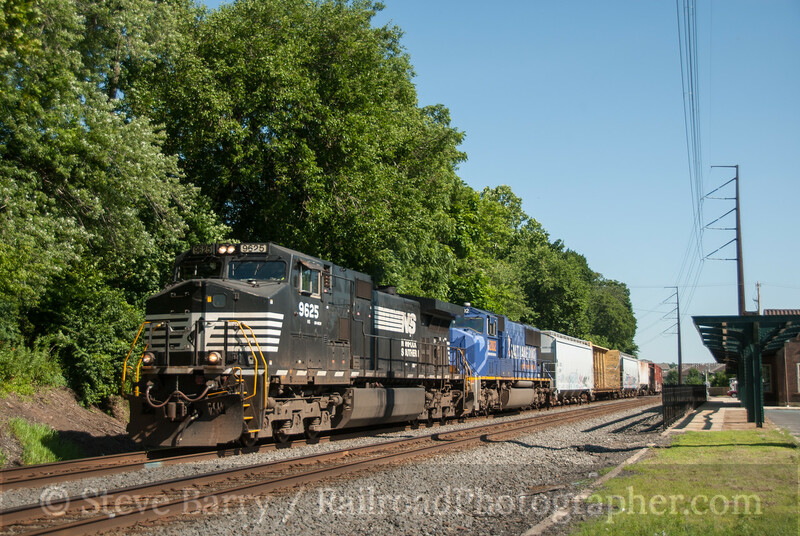 It was back to the sitting Norfolk Southern freight. Finally, a little past 11:00, a crew showed up and boarded the train. The train was still sitting, however, at 11:30 as another RiverLine train zipped past bound for Trenton. Finally, after a long wait, the train began its trek towards Allentown, Penn. From here we shot across the Delaware River into Pennsylvania to get ahead of the train. Even stopping for gas on the Jersey side, we were ahead of the train by the time we crossed the river. Arriving at Bridgeport, we waited from about 12:30 until 2:00 before the train showed up. 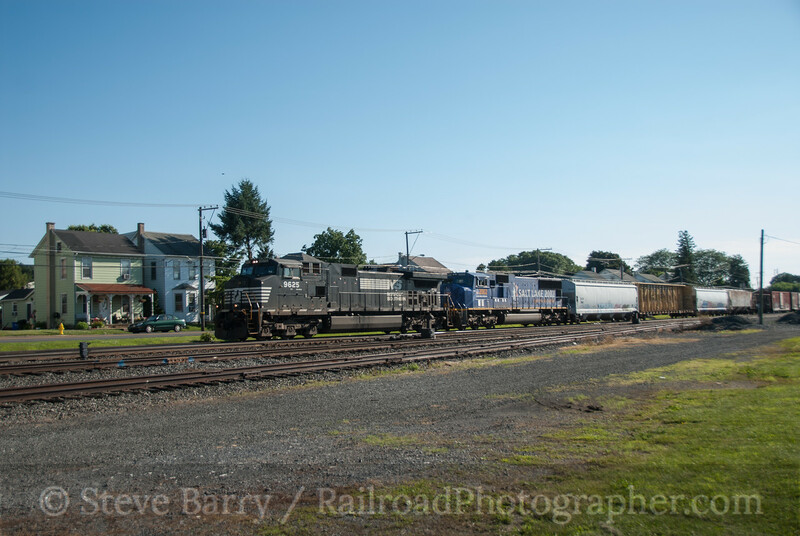 We knew the train had work to do in Abrams Yard near Norristown, and we also knew a local freight was not far behind our train. We stuck around, only to find the local train was set of light diesels with no freight in tow. We then went to the other side of Abrams Yard to wait at Royersford. 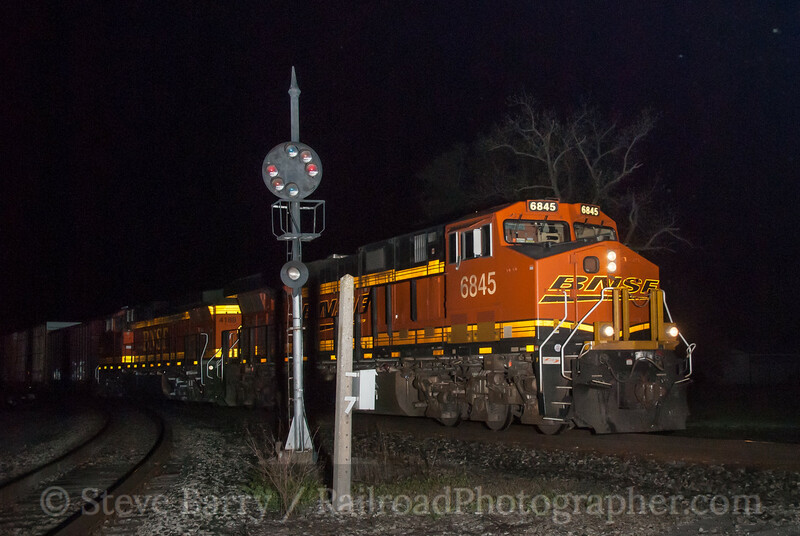 The first thing up was an eastbound train powered by a set of BNSF Railway diesels. 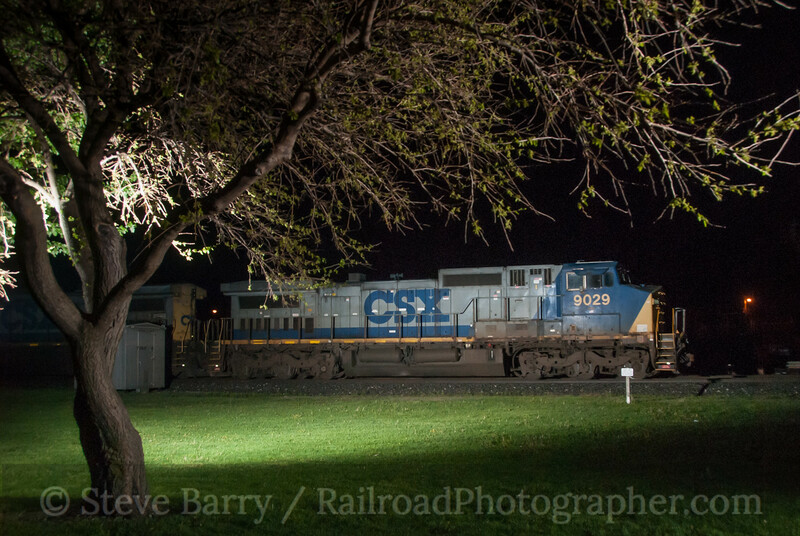 We dutifully photographed it passing the former depot in town. Finally we heard a westbound on the radio scanner! But it was not our train. 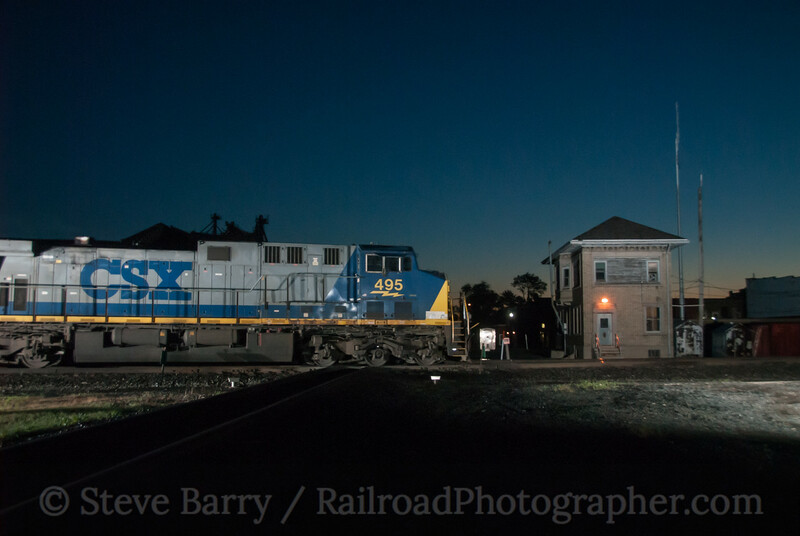 An empty oil train passed the Royersford station. At this point Mike had had enough and headed home. Since I had to go north to get home anyhow, I cut the corner on the train -- it had to go west to Reading then circle back east to get to Allentown. I cut the corner by going straight north, but did make a quick stop in Boyertown to check out the new Colebrookdale Railroad. 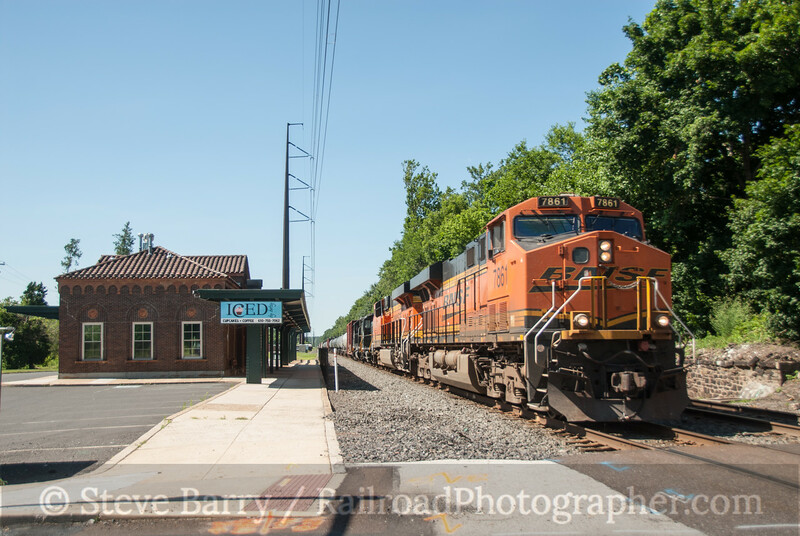 Since the Olympic unit was not making Olympic speeds, I stopped for lunch, then drove to Macungie seeking the train. The light wasn't good there (but I did stop at the cigar store to pick up a smoke) so I headed two miles west to Alburtis. Despite all the stopping, I still beat the train by five minutes. From here the train only had a short distance to go to its destination in Allentown. I stuck around Alburtis for another two hours but didn't see another train. Oh, well.... More photos from this day can be found here.